Paul’s thesis is that which Christians have in Christ (v.3), which is exclusive access to God’s spiritual blessings, outside of which, there are zero spiritual blessings: One must be a Christian. In contrast, the Calvinist thesis is that which an elect group has in the Father, with the result of being spiritually blessed to be chosen to become believers. Thus, Calvinism is the very antithesis of Pauline theology. (1) Basic Reading Comprehension: Calvinists know that v.4 starts with “just as” but don’t consider how that would connect to the principle statement in v.3. See the discussion on Ephesians 1:3. (2) Equivocation: Calvinists see the word “us” and simply assume Calvinism’s elect, instead of defining the “us” as “us who believe” (v.19), which are Christians, and which is consistent with v.3, since this passage is about the Father’s spiritual blessings that are exclusive to Christians. (3) Confirmation Bias: Calvinists see “chosen,” “us” and “before the foundation of the world,” and thus receive confirmation of what they already believe, which is that there is a certain sect of secretly, preselected individuals from eternity for salvation. Simply notice the myriad of Calvinist’s quotes below, which bear out the point that Calvinists see only what they want to see, and filter out the rest. All spiritual blessings belong to Christians, exclusively, “just as” God has eternally chosen us “who believe” (i.e. Christians, v.19) to stand innocent before God. (v.4) The following verses are a list of additional spiritual blessings that are exclusive to Christians. It’s not that Arminians dislike Ephesians 1:4 or think that it is false, but instead dislike what Calvinists assume into the text, and how Calvinists falsely misquote it, by lopping off “in Him,” by speaking of election in the abstract, without it principally being an election of those in Christ. Calvinist, John Piper, writes: “It is because God chose us before the foundation of the world that he purchases our redemption at the cross and quickens us with irresistible grace and brings us to faith.” (Sermon manuscript What We Believe About the Five Points of Calvinism, desiringgod.org, emphasis mine). How could this happen? Are these misquotes the result of a divine veil, and if so, why? That doesn’t appear to be the case at Ephesians 1:4, now does it? That’s precisely what Calvinists do at Ephesians 1:4, when they quote the verse as: ‘God chose us before the foundation of the world.’ Not only is it only half of the truth, it omits the most important part. When God sought a place for His grace, it doesn’t seem to suggest that He found me. Instead, it seems to say that He found His Son, and that my union with Christ is what gives me any standing before God. I am foreknown in Him. (Romans 8:29) It was never about what we have in the Father independent of the Son. Jesus said: “I am the way, and the truth, and the life; no one comes to the Father but through Me.” (John 14:6) I will be blunt: do you think that you had special access to the Father, apart from the basis of your union with Christ? Would such a view undo everything that Paul is saying? My view of Election is that you are chosen in Christ (Ephesians 1:4), and that in Christ, having been foreknown as such (Romans 8:29), you have an eternally predestined inheritance, for all that which God the Father has sovereignly bestowed in His Son. When we are joined to Christ, His election becomes our election. Since Christ was elect from eternity, we can also be said to be elect from eternity, as we are identified with Him. In that sense, His history becomes our history, just as we can be said to have been crucified with Him. (Galatians 2:20) So when a Calvinist asks, “How were you chosen ‘in Christ’ from before you were born, and before you could make a conscious decision for Christ?”, I can likewise ask, “How was I ‘crucified with Christ’ from before I was born, and before I could make a conscious decision for Christ?”, and yet Scripture confirms it? The answer is that when I became identified with Christ, I became identified with what He had done. The point is that the multitude of Calvinist misquotes on Ephesians 1:4 reveals what Calvinists really think about Ephesians 1:4, namely that they were first chosen in the Father, as the elect, whereby God, on that account, chose for these “elect ones” to be given and drawn to Christ. The point is that when you chop off in Christ at Ephesians 1:4, it implies an election an in the Father instead, such that these “elect ones” are chosen secondarily “to be” in His Son. So the flaw is that Calvinism teaches two elections: a primary election in the Father and a secondary election in the Son. Rather, God chose us in Christ because He foresaw us in Him, who is the only place for His grace. Yes, but it’s still a secondary Election, and that’s the problem. Do Calvinists believe that they were first chosen in the Father as elect in order to be chosen in the Son? By “us,” James White infers the “the elect,” as if God chose the elect in union with Christ. In other words, God chose “the elect” [in the Father], and these He has chosen “to become” in union with Christ. However, Christ is the Elect One (Isaiah 42:1; Luke 9:35; 1st Peter 2:6), and we are merely elect based upon our association and identification with Christ. There can be no denying that Calvinistic Election is an in the Father Election, when the source of election in Christ is so plainly grounded in the Father. These statements are exactly correct, and exactly why Calvinism is wrong. Isn’t it amazing how “to be” creeps into Ephesians 1:4? This a cleverly stated ‘to be’ Election which is essentially saying that God, before the foundation of the world, has chosen the elect to redemption in Christ. Arminians reject inserting ‘to be’ into Ephesians 1:4. Again, Calvinism teaches that the final destination of election is to become in Christ, whereas Arminianism teaches that the source of election originates with being in Christ, with the final destination being that Christians are to become Christ-like. 1) Why are you sliding the “to be” around? Paul placed the “to be” after election in Christ so as to show that the purpose of our election in Christ was to be made holy and blameless in His sight? Be careful to notice when Calvinists slide “to be” around. When God the Father sought a place for His grace, He found His Son, and we share in that grace only as being “one spirit” with Him (1st Corinthians 6:16-17), as the Bride of Christ. When Calvinists inadvertently leave off in Christ from their misquotations of Ephesians 1:4, it has the same effect as meaning: God chose us in Himself before the foundation of the world. So why didn’t he include the Calvinists? Aren’t they the biggest offenders since they claim to be eternally hidden in the Father in order to be given to the Son? This is a ‘to be’ election, combined with an in the Father election. These quotes scream of an in the Father election. Why Calvin chose not to explicitly define it as such is known only to him, but it is nevertheless, the single most important element of Calvinism. 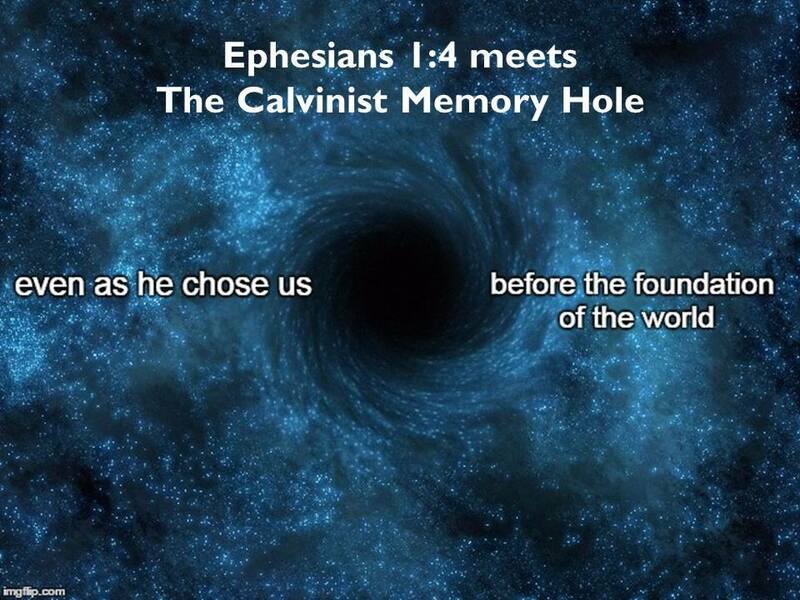 Calvin wishes that Ephesians 1:4 had read: He chose us in Himself before the foundation of the world. If Paul had said that, then it would have been GAME OVER for Arminianism. But because it is grounded in Christ, just as 2nd Timothy 1:9 is grounded in Christ, it serves only as another proof-text for Arminian Election. This is what happens when the cause of Election is separated from its foundation in Christ. Aside from misquoting Ephesians 1:4, this explains what is the fruit of a primary, in the Father Election, where Christ as “Savior” is undermined and Calvary becomes a mere formality since the Father’s alleged, secret love from eternity past had already, in a sense, saved us. This has led some to wonder whether Calvinists are thankful to God, first and foremost, for dying on the cross for their sins, or for having elected them? Listen, Calvary was not a means to an end, for an eternal election, but for the salvation of the world in which God so loved. If there remains a veil over the hearts of the Jews for failing to see Christ in the Scriptures, why should we think that the same veil would not also blind those who teach a primary Election apart from Jesus? The answer to who did God desire for salvation is everyone. For God’s part, that is absolutely His genuine, hear-felt desire for every lost person on the planet. He knows the number of hairs on their head, and He states that the value of their soul is the immeasurable cost of having to send His Son to Calvary to suffer and die to pay for our sins in order to redeem our soul to God. Calvinistic presuppositions say no to all of this. They claim that God wants to demonstrate His various attributes in various kinds of people, and all of this is necessitated by their need to tie their 5-Point system of presuppositions together. Once again, “in Christ” is lopped off because Calvinists do not recognize the qualified choice of having been chosen in Christ. All Calvinists see (which is entirely presupposition driven, and which they deny vehemently), is that, 1) God had an elect caste of sheep, and 2) these were chosen to believe. They will nuance that point to infinity, but it will still be the same thing. The reality, once you get past the presuppositions, is the simple concept, that by referring to the fact that God had chosen us in Christ, Paul is simply reflecting upon the believer’s eternally privileged standing before God, and His objective to honor His Son through His Bride (i.e. the Bride of Christ). Calvinists cannot see past their presuppositions, no more than the Jehovah’s Witnesses can see past the Watchtower Society being God’s special organization. Regarding the phrase, “he chose in Christ to salvation,” is nonsensical, and is intended to appear biblical, but without actually meaning anything intelligible. The verse actually states, “He chose us [in Christ].” (The “in Him” is in reference to Jesus, so the part in brackets is an accurate substitution.) This makes it a qualified Election, of those belonging to Christ, and that’s something that Calvinists will dispute. (Conversely, the Calvinist language sounds more like having been chosen into Christ, than being chosen in Christ.) But the bottom line is that Calvinists are throwing around biblical phraseology, to sound biblical, but without really knowing what to do with it, which becomes very obvious when, immediately afterwards, it proceeds to speak of Election in the abstract (or in general, unqualified terms), and that’s extremely revealing. In other words, immediately after, it speaks of a “particular people” and “those chosen,” but without any logical tie to Ephesians 1:4’s “in Christ” qualification. In fact, it intentionally blurs any qualification in Election, when it speaks of commonalities, such as being on the basis of “neither better nor more deserving,” and having been drafted from the “common misery.” This betrays the fundamental aspect of Election, as a qualified Election, of those who belong to Christ, in terms of the eternal plan of God for Christians. This is something to keep an eye on, when Calvinists try to define Election. The criticism of Calvinism is that Ephesians 1:4 cannot be speaking about Christians, because this refers to an Election before Christians exist, and therefore it must refer to God’s choice of who to make into Christians, but the counter argument is that this is speaking of God’s eternal plan for Christians, that is, for Christians to be made holy and blameless and to be conformed into the image of Christ. This is a good paraphrase of the big picture of Ephesians chapter 1. The basis for our covenant blessings are rooted in being in Christ. With Calvinism, it’s quite different, as Calvinism’s basis for our blessings is having been secretly elected in the Father, and for some inexplicable reason, with the result that the Calvinistically elect are caused to believe and chosen to become in Christ. There’s your contrast. Here is an additional article from SEA on what Ephesians 1:4’s “in Christ” is referring to. Question: What does being “chosen” in Christ mean? Answer: In Him, that is, in Christ, you are elect. From the position of being in Christ, you have the privilege of being legally adopted in the Father. 1st John 2:24 states: “If what you heard from the beginning abides in you, you also will abide in the Son and in the Father.” The only path to the Father is through the Son, just as Jesus stated: “No one comes to the Father but through Me.” (John 14:6) Calvinism has invented another way to the Father called “sovereign grace.” However, if you ask a Calvinist what it means to be chosen in Christ, you will likely get an answer something along the lines of: ‘It means that God doesn’t do anything apart from His Son.’ However, such a squirrelly answer ultimately renders Ephesians 1:4 as the typical secondary election, as will soon become apparent. Question: When do you become in Christ? Question: Were there people in Christ before the foundation of the world? ‘The elect are chosen in Christ’, such that the backdrop of Ephesians 1:4 is a primary election in the Father, whereby the eternal flock of the Father, the elect in the Father, are secondarily chosen in Christ because God doesn’t do anything apart from His Son. Question: What is the relevance, then, of being chosen in Christ from before the very foundation of the world? Answer: It is the will of God the Father to destine glory for His Son, and “us” by extension, for having been enjoined to His body through faith in Him as “one spirit” with Him. (1st Corinthians 6:17) That is the Doctrine of Identification. 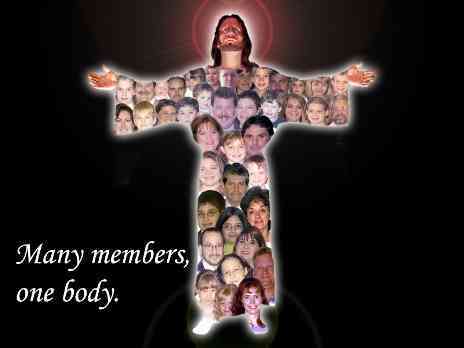 As born again Christians, we are identified with Christ as His Body. That’s precisely why you cannot separate the “us” from the “in Him.” Otherwise, if you separate the “us” from the “in Him,” the condition of God’s election is lost. Question: How did God choose us in Christ before we were born? Answer: Sometimes you can answer a question with a question. For instance, how were we “crucified with Christ” (Galatians 2:20) from before we were born? Question: Who are “the elect”? Answer: Jesus Christ, including those who believe in Him. There’s no such thing as an elect unbeliever, because the elect are redeemed believers, while the rest are condemned unbelievers. In Adam, you remain “already judged” (John 3:18), while in Christ, there is “now no condemnation.” (Romans 8:1) In other words, before, when you were lost, you were separated from God as the old creature in Adam (2nd Corinthians 5:17), and most certainly were under condemnation. But now, being the new creature in Christ, you are no longer under condemnation. Paul asks: “Who will bring a charge against God’s elect?” (Romans 8:33) That means that you cannot simultaneously be one of God’s redeemed elect in Christ while being a lost unbeliever in Adam. Spiritually speaking, In Adam and In Christ are what we call: Mutually Exclusive. ‘God chose us to be in Christ’, such that we are chosen into Christ, by means of a secondary election, in order to be given to the Son, who were before, the Father’s eternal secret possession. The Calvinist: God chose us to be in Christ. Paul: God chose us in Christ to be holy. ‘God chose us in Himself before the foundation of the world,’ being the first cause of God’s secret love for the elect. Question: Who is the “us” that was chosen in Christ? ‘God chose us in Christ before the foundation of the world,’ because God does nothing apart from His Son. God chose us before the foundation of the world. God chose us in Himself before the foundation of the world. Notice how both errors imply the same thing. Now look over the following quotes and decide for yourself whether Calvinism teaches just such an in the Father election. a) Before the foundation of the world, God chose me in Himself. b) Before the foundation of the world, God chose me in His Son. Before the creation of the world, God chose that believers, who are in union with His Son, would stand before Him holy and blameless. The way in which some Calvinists have offered a defense against this chapter is to suggest that I’ve denied that Calvinism teaches an in Christ Election, which of course is ridiculous. Calvinism indeed teaches an in Christ Election, though at the cost of reducing it to a mere secondary Election, whereby, in a primary Election, God has allegedly chosen us in Himself, with the result that these “elect” of the alleged, eternal flock of the Father, are therefore chosen to be in Christ. In my experience, Calvinists have denied the secondary/primary Election allegation, and while citing John 14:6, though are left with having to reconcile a type of Election that ultimately requires that God has chosen them in Himself. At the same time, they realize that that’s not what Ephesians 1:4 states, which they’ve so often quoted, and now are unsure what to do with it. Do they affirm an in the Father Election, when yet Ephesians 1:4 teaches an in Christ Election? What is the Father’s election of the Body of Christ but the election of so many units within that Body, which is tantamount to the same thing as individuals? Indeed, God foreknew each individual in Christ by name. The corporate aspect is simply that God has predestined that this Body of Christ (in union with Christ, as per 1st Corinthians 6:16-17), will receive all the glory that God has prepared for it. That’s the personal/corporate aspect of an in Christ Election. Either I am predestined TO BECOME in Christ, or.... I am predestined in Christ, meaning that I have a predestined inheritance as a member of His body. Either I am chosen TO BECOME in Christ, or.... I am chosen in Christ, speaking of the blessings of Adoption that all Christians share. Does the Calvinistic alternative of TO BECOME logically presuppose a primary election in the Father which results in one being chosen TO BECOME in Christ? If the ultimate reality of Calvinistic Election is that God the Father has an “eternal flock of the Father,” does that inevitably set up a condition for an eternal in the Father Election? Calvin seemed to hint at this by suggesting that those who are eternally “hidden in God” are the recipients of His redeeming grace, whereby James White explains that God gave him to Jesus from before the foundation of the world. Therefore, in order for the Father to give him to Jesus, wouldn’t it logically require that James White first be the Father’s own possession in order to GIVE him away, like the father of the Bride gives His daughter away to the groom? Does Calvinism teach an eternal IN THE FATHER Election, and is that the primary election which results in a secondary election in the Son? Furthermore, if a person is not sealed in Christ until after He believes in Christ (Ephesians 1:13), and knowing that the new birth (born again, new creature) is one of the Father’s many blessings that are alone reserved IN Christ (2nd Corinthians 5:17), how then can you preemptively access the new birth (i.e. Calvinistic preemptive regeneration) before being sealed in Him? Finally, if I have been chosen IN THE FATHER from before the foundation of the world in an eternal Election IN HIMSELF, then does Christ mediate for me in heaven in vain, knowing that I have already been eternally mediated to the Father by His eternal secret counsel? These 3 strikes are what tells me that Calvinism is called O-U-T.
Jesus states: “NO ONE comes to the Father but through Me.” (John 14:6) Hence... NO ONE is plugged in with the Father until first being plugged in to His Son, upon being sealed in Him. Question: If, according to Calvinism, Ephesians 1:4 means that “the elect” are chosen into Christ, then in whom were they first chosen, so that God, on that basis, would choose to give them to His Son, in order to become in Christ? Answer: Calvinism inevitably presupposes an overshadowing election in the Father. Although frequently cited by Calvinists as a proof-text for Calvinistic Election, Ephesians chapter one actually stands as perhaps the strongest proof-text for Arminian Election since it firmly places eternal election in Christ. This Christocentric verse is so often misquoted by Calvinists that it has become nearly epidemic. Most often, “in Him,” which is in Christ, is either completely severed in a Calvinist quote, or it is subtlety substituted for the Father. It is what we call, speaking of Election in the abstract, and it is the bedrock of error. Speak of Election apart from its basis in Christ, and error will follow, as the following demonstrates. Question: Is being chosen in Christ merely extraneous information? If not, then why do Calvinists so often lop it off, as if it was extraneous? Answer: By frequently speaking of Election in the abstract, Calvinists reveal a perspective of Election which deems themselves as the elect of the Father. Question: Does the Bible’s mentioning of being chosen in Christ, merely cloud the matter with unnecessary theological clutter, or is it something vital? Question: Ephesians 1 refers to believers as predestined before the foundation of the world. How do you reconcile this with your view that free actions of people (like choosing to believe in Christ) can’t be predestined or foreknown ahead of time? Answer: This is not about un-believers being predestined to become believers. God made a qualified choice of those in Christ (from the standpoint of being believers). The criticism of Calvinism is that Ephesians 1:4 cannot be speaking about Christians, because this refers to an Election before Christians exist, and therefore must refer to God’s choice of who to make into Christians, but the counter argument is that this is speaking of God’s eternal plan for Christians, that is, for Christians to be made holy and blameless and to be conformed into the image of Christ. Christ alone is the Elect of the Father, and we are elect only by virtue of our connection to THE, one and only, Elect One, as an extension of Himself, being sown together with Him as the Bride of Christ, as part of the Body of Christ. However, Calvinism imagines a “special class” of the Elect of the Father (essentially usurping Christ), who are chosen FOR Christ, and chosen TO BE in Christ, but that is not what the passage is saying at all. Do you notice anything missing? What key item did John Calvin accidentally omit? This is the Christian’s promise and eternal plan of God for Christians, for “us” in the Beloved (v.6), for “us” who believe (v.19).